Ive been chatting with DadHav on the BM2 forums. You are right he does excellent work. The capacitors, while small are rated in the farads and thus can store a significant amount of charge at low voltages. He has also done tests using nicads and Nimhs and found that hours of running doesnt seem to drain the batteries. I think I remember him saying he got over 100 hours run time of two aa's in series and each time he stopped the machine the batteries would stabilise back up to their original voltage. He was measuring to three decimal places @ 3v and had to wait days to see it change. Is there any chance of posting what the results of the motor are then posting useful diagram with parts? Exact specs, exact parts. Like a drawing done in paint showing how this all goes together would be great. Then a list of the parts. Then I could try and replicate this thing. I ordered this kit. They charged my card, but never sent the thing. After ten days of waiting for it to ship I had to dispute the charge with my bank. Was extremely disappointing. to Europe can be extensive. The owner of R-Charge finally responded to me after two weeks. They were out on vacation apparently. They apologized and bumped me to overnight shipping for free. So all in all no harm done. Can't wait to get this kit. Carter: I usually don't say much on forums but I noticed your response from rcharge taking two weeks to respond because of vacations. They must take a lot of vacations because I had same response from them a while ago and it was at least two weeks before they responded. I got tired and had pay pal refund my payment because of not receiving my order. I ordered the 3 inch coil spools. I later found a company out of New York that sold me 273 spools for about 20.00 more then I was paying for 20. I am not too thrilled with there service. Just thought I would let you know. I can give you the phone number if you like. They are the same spools that they sell. Last edited by drodenbe; 10-10-2012 at 11:26 AM. EXACTLY.....one more time for effect EXACTLY. and it worked exactly as described. But a kit is to save you time sourcing parts not to save you money. I think kits are expensive if you ask me. Most of my sourced parts came from china, macau, and thailand at a fraction of the price from ebay. back on the WM forumn when john b. first started posting about the window motor there was rick f. and RS(i think?) who made some fairly large aluminium rotors and shipped them out to people at cost for experiment. i have one and built the window motor using cole circuit as john described exactly. its really something to see how efficient that motor is .. could hit 5000rpm. i experimented for a short while with trying to get it to run off capacitors. i have a whole box of high quality film caps but never got a chance to finish the experiment because life caught up to me and all that. i hope to get back to it some day, it was really neat. 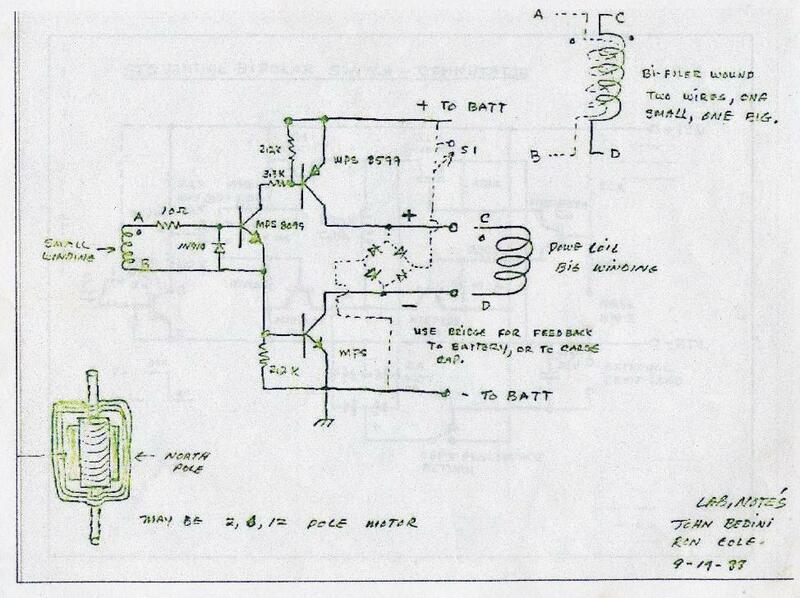 I know why Mike was blowing components - he had no discharge path for the back EMF of the Big coil. Also the solid state relay and hall effect transistor does nothing that a diode would not do. D2 was added to complete a path for Back EMF for the big coil and to protect the transistors. D3 was added to replace the relay. Bridge was removed and replace by D4 - third coil only conducts with BEMF from Big Coil - captures more power into the running cap. This should work better - give it a try and let me know. Hi DIVERFUN, You posted that this should work better. Does that mean you haven't actually built it and tried it? From your description of how you think it will work it appears you are confused about the difference between bemf and inductive spike. Inductive spike from the collapse of the magnetic field of a coil is not the same as bemf. The direction of the current in an inductive spike is in the same direction as the current that created the magnetic field to start with. You are absolutely right! (Somewhat?). There are two things that determine coil (and transformer) current flow - physical and electrical characteristics. Physical because you can wind a coil clockwise (CW) or counter-clockwise (CCW). Two coils - one CW + CCW hooked up the same way to power - each will produce a north pole on opposite ends. Both coils in Bi-filer wound coils are either CW or CCW together because it very hard to wind one coil CW and the other CCW. (It can be done, but is a total waste of time). That puts them in sync - positive current flow in drive coil produces positive current flow in second coil at the same time because the magnetic field is cutting the wire the same direction as the coil producing it. Since the coils are in sync with each other, your inductive spike on the second coil has current flowing the same direction as the drive coil - always. But if you did one coil CW and the other coil CCW, the secondary coil would have current flow the opposite direction from the drive - always. So you could have a inductive spike moving the opposite direction. So now lets talk about the Drive coil. As the current starts flowing through the coil, it creates a expanding magnetic field. As it moves outward, it cuts the wire in the in the secondary coil and produces electricity in that wire. Once the current stabilizes at peak, the magnetic field stops moving and also stops producing electricity in the secondary. The magnet field is still there being supported by the current, but no output on secondary, it is the change in the field that produces power. What happens when you slowly turn off the current? You produce power on the secondary in equal proportion to that change. So lets turn off the current all at once, you now have a magnetic field that is unsupported by current. The collapse of the field happens very fast, producing power on both coils in a very short period of time in sync and in the opposite direction of the drive current that produce the field. Why opposite? As the field expanded it produced current flowing in one direction, a collapsing field will produce current in the same wire going in the opposite direction. There you have it! BEMF in the drive coil and inductive spike in the second coil at the same time and with the same current flow direction. Does it sound like I know the difference between BEMF and inductive spike? I also, stand by my statement "This should work better." I fixed the problems with the circuit, but I am not claiming UNITY. I can't control other peoples machines. This is your experiment to see if it does work better. Last edited by DIVERFUN; 07-19-2013 at 02:11 AM. You are correct about what happens when you turn on power to a coil but you are not correct about what happens when you turn off the power. I have already had this discussion several times with others on this forum. I also have had other people verify that what I am saying is true. Lets look at the simple Bedini School Girl circuit. Very similar to the circuit you have posted except we are only controlling power to the coil by turning on and off the return power back to ground instead of on both sides of the coil. The coil doesn't really care either way. I am going to use the conventional idea of electron flow from the most negative to the most positive. So a power source has a terminal of excess electrons (negative) and a terminal of fewer electrons (positive). When the transistor is turned on the electrons flow from ground through the transistor and through the coil and back to the battery or power source. Of course the initial flow is restricted by the inductance of the coil just as you described. And you are also correct that if we slowly reduce the current the field slowly reduces and would in fact induce a current into another coil winding if it was there. Turning off the current quickly does NOT cause the current flow to reverse direction. I am not sure where that idea came from but my own experiments and training have proven that idea to be false. Whether we turn off the coil slowly or quickly the current does not reverse unless we have a situation that allows the circuit to ring or reverberate. But the initial discharge of the coil is in the same direction as the initial charge of the coil. How would this look on a scope or a meter if we had a meter that could react quickly to a spike? Lets put a scope on the coil with the ground of the scope on the bottom of the coil and the probe in the top of the coil. Staying with the SSG circuit what would we see? Before we turn on the transistor we would have 12 volts at the top and bottom of the coil. But since our scope is connected to the top and bottom of the coil it would show 0 volts. Now turn on the transistor. Our meter is now going to show a positive signal because electrons are flowing from the negative ground to the positive post of the battery making the bottom of the coil in reference to the top more negative. So remember electrons are flowing from bottom to top. Now turn off the coil. The definition of inductance is that it resists change in current flow. There is nothing in the definition that says inductance reverses current flow. So now the source of power is gone but our coil has not discharged but it wants to. Now we still have our scope connected to the top and bottom of the coil. Except now our coil has become the supplier of current instead of the user. Since the current is still flowing the SAME way we quickly get an excess of electrons at the TOP of the coil. So our scope or meter is going to show the top of the coil negative and the bottom of the coil positive. But that is because the coil is supplying the current instead of using the current. It does not mean the current has reversed as so many people seem to believe. If the current reversed as you believe then the SSG could never charge the charge battery because the diode going to the charge battery would be reversed biased and also the battery would be connected backwards. Depending on which way you connect your third coil in your circuit and the amount of turns it has it is possible your circuit will actually charge the cap. However your diodes to protect the transistors are connected correctly. By the way the original pictures and circuit you posted of the guy who claimed it ran off the cap only was later proven to be fake by John Bedini himself. He found the guy had hidden some batteries inside the solid state switch. Last edited by citfta; 07-21-2013 at 04:52 PM. Reason: Corrected statement about protection diodes. Sorry - School is still in - we just had a recess. I am correct. A moving magnetic field across a wire causes electricity to flow one direction - reverse the direction of the movement of the magnetic field and the electricity will flow in the opposite direction in the same wire - Basic physics. An expanding magnetic field and collapsing magnetic field are fields moving in opposite directions - period. Lets look at the simple Bedini School Girl circuit. Very similar to the circuit you have posted except we are only controlling power to the coil by turning on and off the return power back to ground instead of on both sides of the coil. There is nothing similar about the Bedini School Girl Circuit. The two circuits act very differently on how the transistor(s) are used. The SSG circuit amplifies the electricity produced from the magnet as it pulls away from from the coil. The trim pot CONTROLS how much current is allowed through the transistor (and coil) and rarely does the transistor reach saturation. The output from the transistor is half a sine wave because it is amplifying half the sine wave of the magnet induced electricity. (Other magnetic things happen to turn off the transistor, so the output is not a complete half sine wave). Mike's circuit (I do not claim it.) uses a Darlington Switch setup that turns the transistors full on or full off as fast a possible - there is no in between. This produces a square wave output. It also produces a high current drain on the Cap (or Battery) because the only thing that slows the current is the inductance of the coil and the resistance of the wire - the transistor does not control the current, just on or off. The PNP transistor also helps shut off the current faster than the two NPN pair alone. I am going to use the conventional idea of electron flow from the most negative to the most positive. So a power source has a terminal of excess electrons (negative) and a terminal of fewer electrons (positive). I am with you there. That's the way I was taught. I still agree. This is what you are talking about. The current does reverse direction (if it is given a path) because the magnetic field in the coil is collapsing. Back to basic Physics. That is why we put a diode across the transistor - to give BEMF a current path to protect the transistor and to recharge the Cap (or Battery). If the current was still going the same direction, where is it's path? - it can not go through the transistor (it is off) and it can not go through the diode (it is reversed biased) and it would be discharging the cap further. At first because of the inductance - the scope will show a 12 volt peak and then drop back to 0 volts over a short time because the inductance gets less as the magnetic field saturates the coil. Still with you. The definition of inductance is that it resists change in current flow. There is nothing in the definition that says inductance reverses current flow. Correct - Inductance is the coils ability to resist the change in current - it likes a steady flow - no abrupt changes. It has nothing to do with current direction. Same effect both ways. Now turn off the coil. So now the source of power is gone but our coil has not discharged but it wants to. Now we still have our scope connected to the top and bottom of the coil. Except now our coil has become the supplier of current instead of the user. Since the current is still flowing the SAME way. we quickly get an excess of electrons at the TOP of the coil. So our scope or meter is going to show the top of the coil negative and the bottom of the coil positive. But that is because the coil is supplying the current instead of using the current. It does not mean the current has reversed as so many people seem to believe. I found my old Electronic Basics book from when I went to school and they even show that the coil does reverse current flow. Notice the + and - signs for each schematic. Answer this - If the current still flows the same direction from the coil, what is the current path to charge the Cap or battery? No, it is not. I am sure you will have something more to say. Sorry to chime in, I think the problem with understanding Fig. 24-3 from your old Electronics Basics book is that the + and - signs shown in it indicate voltage polarities and not current polarities, right? Just consider the coil as a generator with the indicated output voltage polarities as shown in Figure b (when the 8V battery is off). If you accept this, then the understanding of the current flow direction will be clear in any coil: when the input current is switched off, field collapses but tries to maintain the original current but due to losses it is not able to (the amplitude of the spike starts decreasing) so the original current starts decreasing in value towards zero (it might change direction after reaching the zero value but this depends on the load across the coil (damping) whether it allows ringing as member citfta referred to). This also means that in your very first schematic (in your Reply #41) the big coil (L1) still has no discharge path via diodes D2 and D3, UNLESS the winding sense of L3 (the third coil) which is inductively coupled to L1 allowes current flow into capacitor C1 via D4 from the induced spike, okay? Putting all this otherwise: when you connect a battery across a coil with a given polarity and then you disconnect it, the coil will behave also as a kind of 'battery' (giving out the voltage spike for a short amount of time) but would have an opposite polarity across its terminals with respect to what the battery forced onto it first. When you understand this, all the current flow directions (after the switch-off) will fall in place correctly. Let me propose a simple circuit for you to try. I'll try to describe it as I don't have time right now to draw it up. Take a coil and connect a neon bulb in parallel to the coil. An NE2 will work fine. Now connect a diode at the top with the cathode connected to the top of the coil and the anode connected to a 10uf 100 volt cap at the negative terminal of the cap. Now connect a diode at the bottom of the coil with the cathode connected to the positive terminal of the cap and the anode to the bottom of the coil. Now pulse the coil with 12 volts by any method you want whether a relay or by hand just touching the battery leads to the coil. You can even use the Darlington pair transistor circuit. You will see the cap charging up. And the neon will not be lighting up. Why? If the current reversed as you have said the diodes should be blocking the current flow to the cap and the neon should be firing because of the higher voltage. Now reverse the diodes and the cap and start pulsing the coil again. You will see the cap charging very little and the neon lighting with each discharge of the coil. The cap is only charging because of the ringing of the circuit not from the main discharge as the neon has allowed that to be discharged through it. The diodes are now blocking the initial discharge of the coil. Please build this and study the effects and you will see what I mean. I would like to show you this link where the operation of a flyback inductor or transformer is explained. How does a flyback transformer ( or inductor ) work? "Discharge Stage: The current (which creates the magnetic field) from the source is then interrupted by opening a switch, thereby causing the magnetic field to collapse or decrease, hence a reversal in the direction of the magnetic field flux change (negative flux change over time). The negative flux change induces a voltage in the opposite direction from that induced during the charging stage. The terms “flyback” or “kickback” originate from the induced voltage reversal that occurs when the supply current is interrupted. The reversed induced voltage(s) tries to create (induce) a current flow. The open switch prevents current from flowing through the power supply. With the voltage reversed, the diode now permits current flow through it, hence current flows into the capacitor and the load across the capacitor. If current can flow, then the resulting flow of current is in the direction, which tries to maintain the existing magnetic field. The induced current cannot maintain this field but does slow down the decline of the magnetic field. A slower decline translates to a lower induced flyback voltage. If current cannot flow, the magnetic field will decline very rapidly and consequently create a much higher induced voltage. In effect, the flyback action will create the necessary voltage needed to discharge the energy stored in the flyback transformer or inductor." where I had to make this type of transformer to supply the load of the antenna without effecting the transmitter. Amplifiers in the 70’s used these transformers (Mcintosh) you could short the amp out and nothing would happen. I have experimented with this type of transformer and it is possible to build a Window Motor to run like this but you cannot take any power from it, Unity. I know this is late timing but at least I have posted it. I have experimented with this type of transformer and it is possible to build a Window Motor to run like this but you cannot take any power from it, Unity. I know this is late timing but at least I have posted it. Good to see you back diggin in the posts. Unity is good for me. I see your part 22 16 pole Ferris wheel, she really takes the cake. Good man John I knew I could count on you. will see this post and find out what you have to say. every minute of it. I just don't know much about it yet. To me UNITY means a step up from this University dogma. way you feel about thinking he had a battery in there. So many try to pull the wool over my head I understand. We will be looking forward to your help John. Last edited by BroMikey; 07-21-2015 at 07:36 AM. Hope everyone had a great time this year at Coeur d' Alene. The project with unity might really be a doable interesting hands on project. "The Motor that runs without draining the batteries"
John, Chuck and everyone at Energenx, great job this year ! Last edited by mikrovolt; 07-22-2015 at 10:26 AM. I heard Yaro say John showed it at the ENERGY POW WOW!! work of the window motor. really do enjoy your down to earth performances. that information in picture form is confidential. I am glad for the text. Okay I found a DADHAV video from 2010? Last edited by BroMikey; 07-28-2015 at 03:00 AM. 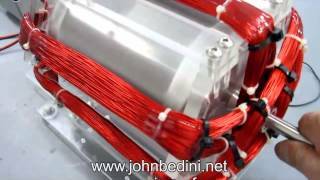 There is no better information than what John Bedini has. deems comparable, then I will take note. and groups that the stuff on the internet is not what he is doing. think it is not completely a certified replicator. Unless I get it right from the horses mouth I won't know. is in full swing again. As usual new things on the horizon. I am getting excited about this new design. You guys are awesome folks, well worth the money. There is other videos that pertain to the window motors there as well. I hope something here might be of some use to you since you are just starting to learn about these fun motors. I will be posting some other videos soon with a different style motors running from a circuit that doesn't require a standard trigger source so you may want to check back later as well. So the first stage would be the SSG circuit (probably in GEN MODE), then the output of the ssg circuit would go to the cap that will power the bedini-cole circuit (that will give a really strong extra punch to the rotor if the cap is high in voltage and capacity), then I can use the output of the bedini-cole again, maybe to feed the bedini-cole cap or a second cap powering another bedini-cole. I know that the output of the SSG and the bedini cole is always less than what I put in, but let's say that with the ssg I get 3000 rpm, then with the output of the ssg into the bedini-cole I could get another 1500 rpm, and then another 750 rpm more, etc, etc. in 3 stages I could get 5000++ RPM using the same power. Then I am going to have regular generator coils to charge a 2nd battery. GEN COILS -> COMPARATOR CAP DUMP -> 2nd BATTERY. And I can probably also include some tesla nodes all over the place. basicly instead of the trigger winding it uses a hall sensor. that one is: 404 (Page Not Found) Error - Ever feel like you're in the wrong place? I have an issue with the idea about running a ssg circuit, and send the recovery to a cap that would be the source for a bedini-cole circuit in the same rotor. The SSG circuit in radiant mode tuned to 1 pulse per magnet would give me a RPM of aprox 3200. but with the secondary circuit in place (bedini-cole) the RPM went down to 2000+ , so I started to try things to see what was causing the RPM loss... After some tests, it seems that the bedini-cole circuit is causing drag even if it is not triggered, is that normal??? I connected the SSG circuit to run the rotor and the output of the ssg was sent to a comparator. Then I placed again the bedini-cole circuit with an empty cap as power source and the drag started again, there is power been sent to the primary of the bedini-cole when the rotor is spinning, by normal induction (the output of the bedini-cole was not connected to anything) I don't know why this is happening since the power coil is isolated from the power source (empty cap) by the 2 transistors. Could this be happening because of the reverse breakdown of the transistors??? Last edited by BroMikey; 07-28-2015 at 05:37 AM.